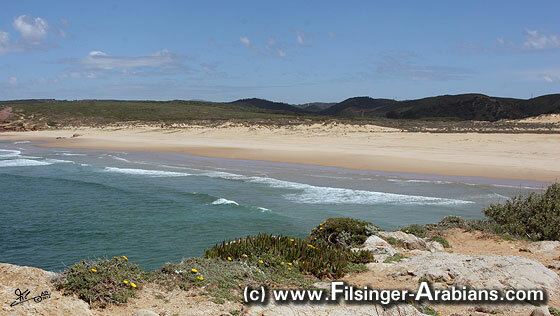 In April 2012 I had the opportunity to visit Petra Strobel in Portugal, who had bought some horses from our stud. It is a very special gift for every breeder to see the horses sold happy and healthy at their new home as it is at this place in Portugal. One of them is the stallion Mansour Bey (Maymoon Bey x Mansoura Bint Maisa). He is a best example to show, that a Filsinger Arabian is not only looking lovely, but has also the ability to perform and work excellent under the saddle, even in the high dressage level. Persuade yourself of his exceptionally quality and see the attached pictures. CA tests done were in undoubtably correlation to the specific horse and it's gens. ALL our horses and bloodstock are N/N, means: all are CA clear, none a CA carrier !l! 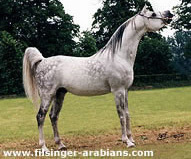 This is another sign of how well the genetic pool of Filsinger Arabians is settled, worked, works and improves throughtout decades, proves the value of all qualities in these bloodlines and genetic family, pedigrees, and the well thought and done line breedings to selected individuals like MALIKAH and/or MAYMOON! of his blood and the strength of his family. MALIKAH - The Queen among the 'Elite' horses and in the breed! In the 3/2011 issue of the German Arab horse magazine "Araber weltweit" being also the official magazine of the German Arab horse Society VZAP an article is published about the influence of the so-named and honored 'Elite' horses. The official title 'Elite' those horses received and carry that reached an outstanding influence to the breed and a breeding record of special value. The article analyzes the influence of the 'Elite' mares until today, and came to the conclusion that our foundation mare MALIKAH has the most influence and value in the breed, and this even with in enormous difference to all the others. Still until today, she is 'THE Queen" of the purebred Arab horse as well as in the straight Egyptian beeding - Nomen est omen! The statistic improves and reflects MALIKAH's influence by four 'elite' daughters (among, our important broodmare MAISA, dam of a 'Elite' daughter and 'Elite' son herself) and three 'Elite' sons (Mahomed, Malik, Manal). MALIKAH's influence steps in the next generations ahead and continues in an enormous input. Among the 2nd generation, the extremely important cornerstone and value of our breeding programme even until today, MAYMOON. Our two other foundation mares, ZABIA and NAZEEFA are both awarded as 'Elite' mares, too. From NAZEEFA it is her son NABIL Ibn Nazeefa, who is another very important cornerstone in our breeding programme through his sons, daughters and grand get. ZABIA records two 'Elite' mares in the 1st generation, and one in the second generation, also with her valuable daughter ZEENAH (by Kaisoon), who adds her qualities to our today's bloodstock, and being regarded as a 'secret jewel'. Our today's bloodstock is a valuable genetic pool of those horses, carefully bred in line breeding to MALIKAH, as well as to MAYMOON, NABIL IBN NAZEEFA and with the bloodline and drops of ZEENAH. We are more than happy to see the genetics and values reflected in the phenotype and unique group of our today's horses, and get it regularly accomplished by vistors, breeders, international experts coming to see them. Since, she makes really very nice and semi-professional pictures of the horses at stud, but also at shows she sometimes has the chance to attend. However, being still a kid, but with a great heart and sense for all kind of animals and especially for horses, it still happen what happened recently during a photo shoot: Angela was so over-whelmed from her little model, the most charming filly foal MAJEEDA, that she moved down her camera, approached the little cute sweetie, and preferred to enjoy, to touch and to play with her model instead of shooting her in her beauty! Filsinger Arabians started in 1957, at a time, when nobody did talk or was aware about the later defined "straight Egyptians". In 1962, MALIKAH entered the Filsinger family's life, and she was the beginning and the cornerstone stone and foundation of their straight Egyptain breeding programme. Today, the Filsinger Arabians' bloodstock represents a unique group of straight Egyptians of this MALIKAH family, a present family of homebred horses bred in 3rd, 4th, 5th, 6th and even already in 7th generation at stud - something that not many other studfarms can prove. Filsinger Stud is a breeding and bloodstock source in history of decades, following the classical criterias and definitions, and concentrating on the qualities of some improved individuals. A breeding in traditions and an own sense, beyond any fashion streams! The consistancy and quality speaks for itself , the unique quality herd of broodmares and the sires make it obvious. The above picture from June 2009 shows the old and new generations at stud together in one field. The two grand ladies, the 1983 born MANSOURA and ZENAYA in the mid, and some of their daughters, grand daughters, great grand daughters, and sisters around - sharing their days and pasture. It is a pleasure to watch them - together - and every day - and every day again! Some of the new foals are born, and we are very very happy with the result. It is indeed the fact that the family of this bloodline proves year by year, generation by generation. The matriarch MALIKAH, her grandson MAYMOON and her son MANAL added by the NABIL IBN NAZEEFA blood, they brought us what we were looking for. And as of, we intensify this blood with the younger generations, for example through, and on male side, with the two herdsires MOGADOR el Malik (by Manal) and MAHARAN el Nabil. Both are out of MAKLIKAH daughters by MAYMOON, our of two full sisters (Munifah and Marani). 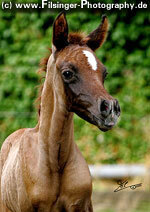 In April 2009, our first foal by the young sire MAJEED el Mogador is born - MAJEEDA. She is also the first foal born at stud in 2009, and something really special - in quality and in disposition. Awaiting some more foals, we welcome each one in the family! For many years, we had not been doing any new pictures of our horses. Time was too busy, photographer was not available, weather crossed plans, or many other reasons. This year, we decided: it MUST succeed! And it did! The day came when everything worked out propperly. It started by the washing and showering of the horses, and everybody helped. At the end, we all really had enjoyed, independant that such a photo day is hard work! We hope, you enjoy the result, the new pictures of several of our horses. Watch them in the stallions' and mares' section, and in several individual pages. 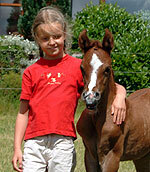 In summer 2006 , MINDIF gave birth to a cute filly by the NABIL son ZEYMOON el Nabil. Relating to their ancestors and the family, and following the tradition of the bedouins, we choose normally names starting with a same letter as the damline, and try to find special, individual, unqiue names for our horses. 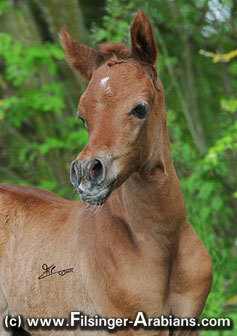 This foal came of the famous "M" line of MALIKAH! MINDIF is a daughter by NASRAN Ibn Maymoon and out of MANSOURA (Maymoon x Maisa). By so, she is a great grand daughter of MALIKAH. Her name we found through the music of a jazz artist we like, Abdullah Ibrahim. "Mindif" is a solitary mountain in Cameroon. she is also something special! Born with us in 1977, we shared a lifetime with our stallion NABIL Ibn Nazeefa and enjoyed every day. On 19. June 2006, our longtime compagnion passed away! breeding and bloodstock, continued by his sons, daughters, and their progeny! We are thankful for more than 29 years we could share with this great stallion and horse personality! About Breeding, History... and new ways! To behalf of newcomers to the straight Egpytian breeding, but also for longterm breeders, people interested in presence AND history, and those who never had the chance to see alive some of the foundation horses and famous anchestors in the straight Egyptian breeding - we are pleased to inform that some historical video clips were just placed into our website! The original films were taken in the late 80ies and in 1990. Today, with fast DSL transfers and WindowsMediaPlayer, those video clips are a new way to allow you seeing our horses in action, and sharing our breeding and history. See amongst, MAHYUBI Ibn Maisaand his sire, NABIL Ibn Nazeefa, and his maternal half brother, the late NASRAN Maymoon; his paternal half brother, DAHMAN Maymoon, the Grand Champion MANAL, and last but not least, our three foundation mares, MALIKAH (with 27 years), ZABIA and NAZEEFA (both aged 23), and their daughters, ZEENAHand MAISA. Congratulations to H.E. Sheikh Abdulaziz bin Khalid Al Thani of Al Rayan Farm in Qatar, for his success at the 8th Qatar National Show end of November 2005, especially for his 1998 born, home bred mare, NAAMA Al Rayyan (Safir x Ansata Majesta) winning - "Mabrouk"! NAAMA Al Rayyan is coming from the valuable MAKLIKAH tail female line, and shows once more the prepotency of this blood and heritage. and his breeder and owner in Portugal, Mrs. Strobel, did participate and succeed in special dressage and driving lessons, this to increase and fine-tune their basics on higher level. Under the experienced instructions of Desmond O'Brien, from the "Wiener Hofreitschule" in Vienna/ Austria, held at "Quinta Az Zuira", this 1998 born straight Egyptian from the FILSINGER ARABIANS bloodlines and his owner were trained. Desmond O'Brien was very excited about the fast learning and constructive cooperation of ZAREEF who improved by example the qualities of our longterm breeding. Welcome to our newest Arrival ! On 7th August 2005, a cute foal arrived to us - out of MAHA Bint Mansoura (by Maharan/ Nabil Ibn Nazeefa x Marani el Malikah, by Maymoon) and by MOGADOR el Malik (Manal x Munifah Bint Malikah/ by Maymoon). We are very much looking forward to his future while combining, respresenting, and multiplying the best bloodlines and anchestors of FILSINGER ARABIANS. Our first foal in 2005 was born on 9th of May. It is a filly by SHEIKH MAYMOON and out of MASRIA Nabilah, who is by Nabil Ibn Nazeefa and out of Munifah Bint Malikah (by Maymoon). This little queen will carry on the valuable blood of MUNIFAH Bint Malikah, a mare we lost much too early and very unexpectedly with 11 years. MASRIA and also her filly foal now will take MUNIFAH's blood and qualities to the future by tail female line, while the influence through her sons, MOGADOR el Malik and MUNIF el Nabil, is already preserved at FILSINGER ARABIANS. Congratulations to Mrs. Petra Reiner for her success in the 40 km Endurance Ride at Mehrstetten - competing with straight Egyptian mare DAHMA MAYMOON and finishing fourth place. DAHMA MAYMOON is a FILSINGER ARABIAN in four generations on both sides, sire's and dam's, and is representing the breeding program in performance qualities. DAHMA MAYMOON is by International Champion DAHMAN MAYMOON, and dam is the International Champion & 1988 Asil Cup Supreme Champion"Female", BINT IBN MAYMOON. Eight-year-old Angela doing her winter ride in the first days of January sitting on long coated but anyway most beloved friend MOGADOR el Malik. The mares did enjoy their first run into the white fields, while all horses are presently looking more like "Teddy bears" in their long haired winter coat than"desert horses". However, also in the high snow and cold temperatures, they are galopping by "flying without wings" - throwing the snow behind their hooves like they do with sand in the desert galopping around! 2004 was a year giving us several interesting moments! FILSINGER ARABIANS had many visitors and international guests from different countries, amongst from America, Canada, Australia, the Near and Middle East, from Portugal, Norway, Finland, Holland, Belgium, and more, and obviously from Germany. And we received a lot of inquiries and interest from more and other countries about our horses and breeding. We are enjoying our new colt MAJEED El Mogador giving us special expectation and hope for the future in the FILSINGER ARABIANS' breeding program. A limited number of our mares were breed again, and we are looking forward to see the new babies and results to arrive in 2005, foals we are intending to see for our future. from the VZAP as "Elite" Horses upon their individual qualities and breeding records! to a FILSINGER ARABIAN. And 28 are tracing back once or more times to MALIKAH. in page 'Hall of Fame' here in this website. Angela became very, very happy yesterday! After eleven months of waiting, a very long time for a seven-year-old girl, her much awaited foal by MOGADOR el Malik (Manal x Munifah Bt.Malikah/by Maymoon) out of MAHARANI Nabilah (Nabil Ibn Nazeefa x Marani el Malikah/ by Maymoon) got born yesterday, 11th of June, 2004! In these first days in foal's life, they enjoyed their moments outside and in the fields, and did make immediately to friends! 11 wins and 12 reserve wins. Another great example and improvement for the performance qualities of the purebred and straight Egyptian Arabians, especially from this blood and breeding. Congratulations to the owner and rider, Mrs. Marion Schneider, and good luck for the future with a lot of more success and continued pleasure with her FILSINGER ARABIAN. Saudi Arabia and Bahrain. Ten World Champions/ res. plus several multiple champions on national and internat. in Dubai. Congratulations to all winners. Al Rayyan) winning the Junior Champion Female title. Res. Champion Filly. So also special congratulations to H.E. Sheikh Abdullah bin Nasir Al Thani, Al Naif Stud in Qatar. at the Sharjah International Arabian Horse Show. in March, Sharjah and Dubai. influence is of highest value and worldwide until today. qualities and prepotency in breeding. wonderful celebration to the MALIKAH damline. Ansata Majesta) became Qatar Int. Champion Mare. Khalid Al Thani, from Al Rayyan Farm in Qatar, and H.H. wish them all the best with their horses and this proven line. all carneval enthusiasts of the "5th Season in Year"
by wishing them some happy and enjoyable days! ..... just watch and enjoy the pictures! Last year, in 2003,she costumed as "Pippi Langstrumpf"
Competing in the 2003 Jordan Int. Show at the Royal Stables in Amman the lovely 2001 filly SUNDOS Al Nasser became honored as International Junior Champion Female for her new owner, H.H. Sheikh Ammar bin Humaid Al Nuaimi, Crown Prince of Ajman, United Arab Emirates. One year before she had suceeded for her breeder, H.E. Sheikh Nawaf Bin Nasser Al Thani, from Qatar, as 2002 Nations Cup Junior Champion Filly res. in Aachen, and TOP TEN Filly at the 2002 World Championships in Paris. Through her sire Ashhal Al Rayyan this Egyptian-Polish bred filly is tracing back again to MALIKAH. Another great moment one could meet when her owner, H.H. Sheikh Ammar, did show SUNDOS himself at the 2004 International Arabian Horse Show in Ajman, getting judged and winning Amateur Handlers class in excellent style of showing and by wonderful relation between filly and handler. Congratulations to both! 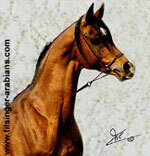 * 2003 World Champion Mare GELGELAH Alb. (photo above), bred by Dr. Nasr Marei of Albadeia Stud in Egypt and owned by Halsdon Arabian Stud, Mrs. Shirley Watts, Great Britain, is tracing back three times to MALIKAH on paternal side. * 2003 World Champion Colt INSHALLAH (pictured below), bred by Lönhult Arabians, Sweden, and now owned by Al Khalidiah Farms, H.R.H. Prince Khalid Bin Sultan Bin Abdul Aziz Al Saud, Saudi Arabia, is tracing back to MALIKAH through his father. * And last but not least, 2003 World Champion Filly res., the one-year-old Simeon Sadik daughter H.S. 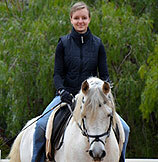 RAMIRA, bred and owned by Halsdon Arabians, England, is tracing back to MALIKAH through her sire! Champion Stallion res. of the ECAHO affiliated A show. * 2002 World Champion Mare res. BINT SAIDA Al Nasser (pictured below),bred and owned by H.E. Sheikh Nawaf Bin Nasser Al Thani, also from Qatar, shows MALIKAH twice in her pedigree and at paternal side. Congratulations to both studfarms, Al Naif Stud and Nasser Stud, for these lovely horses and their success! Congratulations to Al Naif Stud, Qatar, for her great success with RN MEZNA (Imperial Mahzeer x Ansata Magnifica) being named 2002 Qatar National Champion Mare as well as she was already named one year before 2001 Qatar National Champion Mare res. 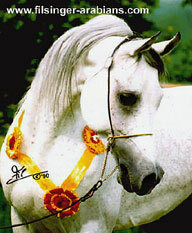 This very lovely, 1996 born mare, was bred by Al Rayyan Farm, H.E. Sheikh Abdulaziz Bin Khalid Al Thani, and is tracing back to MALIKAH in tail female line. Pedigree readers and experts will find MALIKAH three times in the pedigree of RN MEZNA. At the 2001 ECAHO B rated Show in Gut Ising at the lovely Chiemsee lake, the straight Egyptian MANALgrandson ZEKHIEL did win 2001 International Champion Stallion. ZEKHIEL is a son of the Filsinger bred mare ZEEMANA (Manal x Zeenah) and is tracing back in tail female line to the foundation mare ZABIA. ZEEMANA was bred and sold from FILSINGER ARABIANS to an American breeder exporting her to the U.S.A. in 1982. 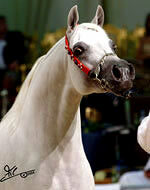 ZEKHIEL is owned by "Arabian Sun Horses" of the Bentchikou family, Belgium, for who he did win this title. And also the "Arabian Horse Center" in Kuwait did welcome and own a mare from the MALIKAH tail female line, the 1988 born Ansata MERYTA (pictured below), being a one year younger fullsister to Ajmal Stud's MAJIDA. 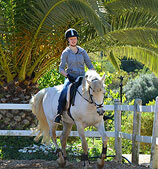 and able to reach and show high lectures of riding lessons! by Maymoon) became National Champion Stallion res. Stallion res. at the Egyptian Event Europe. winning for getting honored the ultimate title. at the open International Kauber Platte show in 1991.
success: class winner of the two-year-old Fillies, Int. Junior Champion Female, and "Best in Show". She also had been the highest scored horse at show! winning his class of 7-10 year-old stallions. by winning the title as Senior Champion Stallion res. became judged and selected into the TOP TEN! 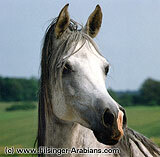 tracing back to Filsinger Arabians foundation mare MALIKAH! Amir Fayyad, both by Mahyubi Ibn Maisa). in a halter show became at the 1988 Asil Cup Int. Champion Filly & Supreme Champion Female. winners/res., and 10 of all decorated TOP TENs were tracing back to a Filsinger Arabian! And Copying or Downloading is prohibited!